These little biscuit cup treats are filled with bacon, cheese, tomato and basil are like little mini-BLTs in a bite sized form, perfect for parties! I went to a party recently where one of the guests brought some little biscuit cups similar to this. Well, they were delicious! When I asked the person what was in them, she said they had bacon, tomatoes, Swiss cheese and mayonnaise. Well, of course, I came home set on recreating them! I thought the only thing missing to make them like a BLT is some kind of green ... and what better to go with tomatoes than fresh out of the garden basil, which I happened to have plenty of. Now this appetizer would be pretty forgiving for adjusting in my opinion - more or less bacon, more of less mayonnaise, more or less basil, and whatever your favorite cheese. Experiment! Be sure to thoroughly clean the tomatoes so that you have only the ribs and the meat of the tomato left - you want the tomato dry before you chop it up so you won't carry a lot of water into the filling. I didn't happen to have any Swiss cheese in the house when I decided to make these, so I used the remainder of a block of white American cheese that I needed to use up anyway. I wanted to split my biscuits into three layers but the brand I had on hand wasn't being very agreeable and only wanted to easily give me two even layers. As it turned out the two layers worked out fine, but if I were making these up for a crowd I think I'd go for stretching it out by separating each biscuit into three layers to end up with 24 cups, and to have a thinner cup. I'm thinking these would also be great with cooked and drained sausage, or some well drained ground beef seasoned with taco seasoning, and pepperoni too! There's really a lot of room for variety with these, and I'm sure it's all been done before - but I can tell you one thing ... okay two things. They are easy and because they are made in mini muffin pans, they are a perfect finger food for parties, and for game time, which is what I made these for. Serve them warm or at room temperature - either way they are yummy. Once cooled, they travel well and also reheat well. Enjoy! For more of my favorite appetizers, visit my page on Pinterest! Cook the bacon to crisp, remove, drain and set aside. To the bacon fat, add the chopped onion and cook until tender; toss in the tomato and cook for a couple more minutes. Remove, drain and set aside to cool. Stack basil, roll like a cigar and thinly chiffonade; set aside. Reserve about 2 tablespoons of the cheese and set aside. 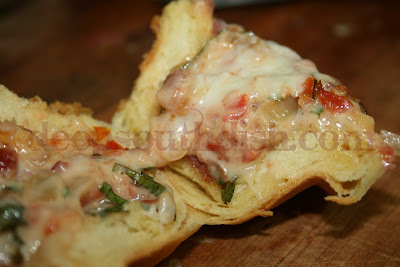 In a small bowl, combine the bacon, onion and tomato mixture, the shredded cheese and the basil. Combine until well mixed; add mayonnaise and blend in. Separate each biscuit into thirds, or halves or if you can't get three pieces easily, so that if you start with 8 biscuits, you have either 16 or 24 thin biscuits. Spray mini muffin pan with butter flavored non-stick spray and press biscuits into each tin. Spoon 1/2 to 1 tablespoon of filling into each biscuit, depending on how many you have. Sprinkle each biscuit top with just a bit of the reserved cheese. Bake at 375 degrees F for about 12 to 15 minutes or until bubbly and golden brown. Cool for 5 minutes in the tin, remove and serve, warm or at room temperature. Cook's Note: May substitute one can of well drained, diced tomatoes or Rotel diced tomatoes. Lasagna Biscuit Cup Variation: Brown 1/4 cup each of onion and bell pepper in 1/2 tablespoon of cooking oil until tender; add 1 teaspoon of minced garlic and cook another minute. Add 1/4 pound each ground beef and Italian sausage and brown; pour off excess oil. Stir in 3/4 cup of pasta sauce and set aside to cool slightly. Mix together 1/2 cup of ricotta cheese, 1 tablespoon of Parmesan cheese, and 1/8 teaspoon each of Italian seasoning and dried parsley. Prepare cups as above, adding a pinch of the Mozzarella in each cup. Top with the meat sauce, ricotta blend, distribute the remaining cheese on top of each cup and bake as above. 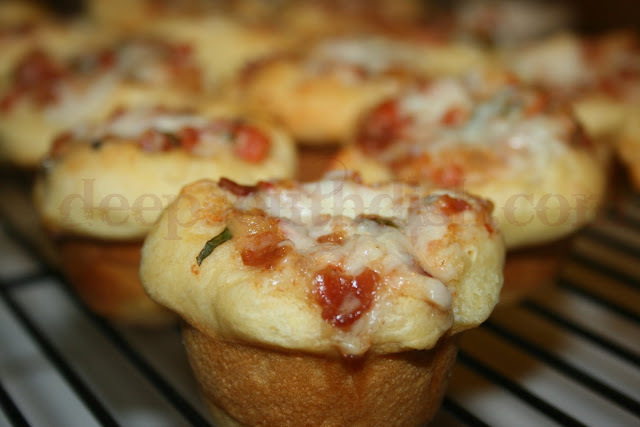 Pizza Cup Variation: Prepare as above, except sprinkle a pinch of the cheese into the bottom of each biscuit cup, spoon pizza sauce on top and add desired, precooked toppings. Divide the remaining cheese among the cups and sprinkle the top lightly with Italian seasoning. Bake as above. Sloppy Joe Biscuit Cup Variation: Brown 1/4 cup each of onion and bell pepper in 1/2 tablespoon of cooking oil until tender; add 1 teaspoon of minced garlic and cook another minute. Add to that 1 pound of ground beef and brown. Drain off all excess oil. Return to the skillet and add to that 1/4 cup of ketchup, 2 teaspoons of brown sugar, a dash of Worcestershire sauce and salt and pepper to taste. Let cool slightly. Prepare cups as above, except substitute cheddar cheese, sprinkling a pinch of the cheese into the bottom of each cup, divide the sloppy joe filling evenly among the cups and top equally with the remaining cheese. Bake as above. Taco Biscuit Cup Variation: Brown 1/2 cup of onion in 1/2 tablespoon of cooking oil until tender; add 1 teaspoon of minced garlic and cook another minute. Add 1/2 pound ground beef and brown; pour off excess oil. Stir in 1/2 package of taco seasoning and 1/4 cup of water. Simmer until liquid reduces and mixture thickens. Prepare cups as above, except substitute cheddar cheese, sprinkling a pinch of the cheese into the bottom of each cup. Divide the taco filling evenly among the cups and top equally with the remaining cheese. Bake as above. Garnish with shredded lettuce, chopped tomato and additional cheese, if desired. Bacon Cheeseburger Biscuit Cup Variation: Prepare as above for Taco Cups, except eliminate taco seasoning and use bacon in original recipe. Breakfast Biscuit Cup Variation: Heat 1/2 cup of southern style, cubed frozen hash brown potatoes, or parcook 1 large baking potato, peeled and cubed. To that, add 2 large eggs beaten; heat, stirring regularly until eggs & potatoes are cooked though; set aside. In a separate skillet over medium heat, brown 1/2 pound of breakfast sausage. Sprinkle a tablespoon of flour into skillet; cook and stir for 2 minutes. Slowly stir in between 3/4 to 1 cup of milk until a thickened gravy is formed. Prepare cups as above, layering in a pinch of cheese, the potatoes and eggs and topping with the sausage gravy. Distribute the remaining cheese on top of each cup and bake as above. May also substitute cooked bacon for the sausage. Check These Appetizer Recipes Out Too Y'all! Oh my gosh, my mouth is watering! I'm trying out this recipe for sure! O Lord. I just fell in love with the sound of these, Im going to make them this weekend!!! I will comment back and let you know how much I loved them!!! You have a New Follower! Mary these look so good! They are on my list to try! little baby pizza cups, look great! Great idea Mary. Look and sound totally wonderful. Mary, these look addictive! I'm going to try these this weekend..thanks! I've made something similar before, from a Pampered Chef cookbook and they were deliciious. I forgot about them. I'll try yours. Thanks for the reminder. These look/sound and I bet taste so good. I am making them this weekend! what a great brunch offering. love! Mary... these would be great to take hunting or fishing with us! I'm going to give them a try. I love the mini muffin pans! This is a great recipe, I got mine from a friend years ago and make it quite a bit for parties/potlucks. You can use bacon bits as a short cut - the real bacon pieces, not the crunchy fake ones. The cups still come out yummy! Great recipe! Easy to make and everyone at the party loved them. Think I'm going to make a "breakfast" variation next week. Has anyone done that yet? Any recommendations? I haven't done a breakfast version of these but I know I've seen something like that before. Need to give it a try! Thanks so much - so glad you enjoyed them! They are nice little bite-sized yummies aren't they? I have a hard time not eating ALL of them LOL!! oooooooooohhhhhhhhhhhh, these sound so yummy, if i can keep the stinkin OOGLY tomato worms out of my maters, I'm going to have to make them. SURE hope i don't have to use canned! OR better yet, maybe i can get a bud to make them FOR ME!!! Blessings from Central MS. Question, i want to make the biscuits from scratch. is there anything that needs to be changed, added, etc? If you use a basic southern biscuit recipes, you're gonna lose the flakiness from the flaky canned biscuits. Even though you're pulling apart the layers, the dough still bakes up with flaky layers. If you look at the picture of the cup cut open, you'll see what I mean. For homemade biscuit dough just be sure to roll them out very thin - almost like you're doing a dumpling really - because they are gonna puff up and thicken as they bake. I think the dough will end up a bit more dense than the commercial flaky biscuit dough, but it should still be good. Let us know! update: did these both ways, well you are very right, the commerical flaky biscuit dough was much better than the homemade dough. but they still got ate, so not a lost there. I will use the can dough again and not do homemade. I did also use a french bread can dough and made them into little finger grab goodies, sliced the dough with a pizza cutter and ut the mix on top. you will have to make a boat kind of out of it but it works. Find a method that will work. Shape as a snowman for Christmas snackie party item or just for no reason @ all food. Have fun and enjoy! Thank you for taking the time to come back by and give an update! Great tips too - thanks!